Get To The Chopper is still a little neglected in Extinction, but it was my favourite game mode in the original game, and I want to add some more variety to the game by converting more maps to support GTTC. Here are some of the maps I plan to make. For the level diagrams below, I'll be using the ones I posted in the PCE Level Diagrams thread. Additionally, The capture points will be marked with big white text, black lines representing extra fences/blockers, and white lines representing possible paths between the capture points (approximate distance in Unreal units, and time in seconds). Also note that you should ignore the markers for health/ammo/corpses, as these will obviously be moved later. As the name suggests, this is mostly the same as GTTC-Docks, but starting at the front of the ship, working your way around the base anticlockwise and ending at a helipad on the pier. 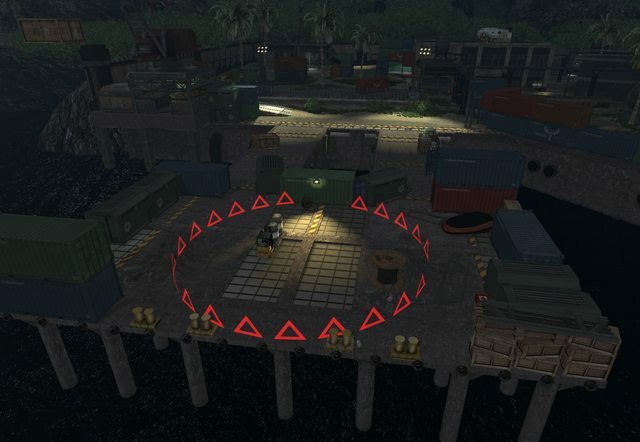 Docks is a tried-and-tested map so this should be an easy one, and will spice up any GTTC server! No diagram needed, since the layout will not change. I'll be working on this first, since I won't need to start from scratch. The dino spawns will need to be adjusted, however. The humans spawn inside the West hangar (usually out of bounds in TDM) and go to the south bunker. Then they go to the generator (might remove tall grass here to make combat easier). Then, they have to work around the edge of the map and through the main hangar to get to the helipad. There's also a dotted line representing a possible extra path I could add if the last route is too hard. This will shave off 10 seconds, and help humans to potentially dodge tyrants. I've already started making the insides of the West bunker and plan to make the GTTC variant rain-less for a change of atmosphere. In the first concept, the base gates start out closed and the rocks/breaks are removed, so there's no way for humans to get in. Humans start behind the North gate and capture A and B simultaneously. These will be security huts that sit next to the East and West perimeter fences, and will themselves be fenced off with 2 ways in. Once both A and B are captured, they become spawn points, and point C in the main base will be available (the base gates will open at this point). After that, the gate to the helipad on the East side will open. I think the gate will become a choke point for this final objective, so I will have at least one other path. The dotted line represents a possible path through the underwater river that's usually covered by a metal grille. Notice that the South half of the map isn't used. This could be where the dinos spawn for the majority of the game, and could even be blocked off to humans entirely with short cliffs. In the second concept, I'm trying for a shorter, simpler set of waypoints. Starting at the South West cliff bunker, the humans take the North West shed (very easy), then the main base, then the South East Bunker, then the helipad. In this one, the alternative path is a ramp that goes up to the higher level around the level edge, and down again to the lake. Do you like these ideas, or you have some suggestions of your own? Are there any other maps that would work well for GTTC? Please discuss below! Use my level diagrams to draw your own routes - a picture is worth a thousand words. • PCE Level Diagrams - adding more each week! • GTTC Variants for Classic Maps - let's give GTTC some more love! I really like these ideas and I agree GTTC needs more love. I've also recently been thinking about how Geothermal might work as a GTTC map. Having the lava rise and lower when points are captured could make for interesting gameplay as well as block off the humans when needed. But the problems with this map would probably be that it would be too easy for humans while larger dino's like Carno and Tyrants could be having a hard time here. I've also recently been thinking about how Geothermal might work as a GTTC map. We strongly considered this before making it Survival-only. It's the reason there's rooms A,B & C, not to mention that gigantic elevator in the center which was going to be the exit. We had the notion that to escape, players would fight to the upper catwalks under time pressure and get to the lift. There were all sorts of potential problems with the idea though, so we gave up on it. I'm really interested to see these GTC map mods, curious how much you'll need to change to make it work. 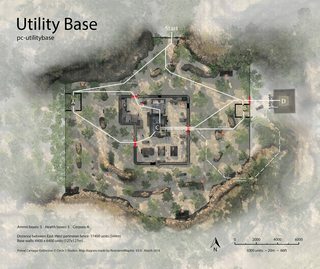 Are you going to make geothermal TDM map too? At your house, eating all the KAPPAS. It's a nice idea, especially if the additional paths around the outer edge are made accessible... but it's gonna need a lot of work. Currently there's lots of open space without cover which will make it tough for dinosaurs to hide/ambush. Also, all the blocking volumes are specifically (and very generously) set up for survival mode, and go all the way up to the roof, so dinosaurs won't be able to jump on top of anything until every single one is removed or changed to a ClassBlockingVolume for humans. Sounds good, especially because at first I thought it would be a TDM map. If you do it, post it on forums. Here's a sneak peek of the new pier for GTTC-Docks-Reverse. What's that, you ask? Where's the helipad? Don't worry - I have a plan! That looks really cool! Looking forward to see what idea you have with the absence of the helipad and all. Last edited by RestrainedRaptor; 08-06-2018 at 04:29 PM.